Video tutorial company, MacProVideo, has released a new version of N.E.D., its Nonlinear Educating Device. N.E.D. 2.0 gives you a completely redesigned, one-window interface to all of the video tutorials purchased from MacProVideo. Based on iTunes, the new look of N.E.D. also gives you access to the MacProVideo forums, the admin section of your account and a help section. You also have an integrated search engine that allows you to search for keywords throughout all of your video tutorials. As a longtime user of MacProVideo with many tutorials, this is a huge feature. The application also has the ability to check for updated tutorials and download them in the background. When you click to watch a video, you are given a list of chapters that you can skip through or you can watch from the beginning. You can watch the videos inside of the N.E.D. application window or fullscreen. N.E.D. 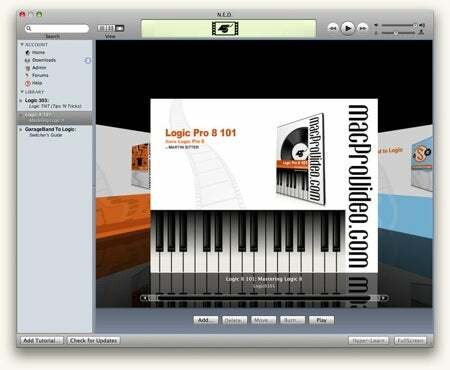 is a free download from MacProVideo.